Airplane seats can make or break a flight. A good seat: one that has plenty of legroom and overall space – these make your trip enjoyable. A bad seat: one where there is so little legroom your legs end up massaging the back of the person sitting in front – these make your flight a living hell. I’ve sat in both types of seat. The seat on the left was on a 5 hour flight from Doha (Qatar) to Belgrade (Serbia) flying with Qatar Airways on an Airbus A321. As you can probably tell, this seat was a nightmare – my knees were pressing into the back of the passenger in front of me and the tray table was crushing into my knees. Mercifully the person in front didn’t recline their seat. In the photo on the right, I sat in what has been the best seat of my life so far. This was on an 11 hour flight from Perth (Australia) to Doha (Qatar) flying with Qatar Airways on an Airbus A380-800. I had so much room that I could fully extend my leg and still not touch the seat in front. Let me tell you, once you’ve sat in a good seat you never want to go back to a bad seat ever again. Before I dive into how to find the best seats, first we need to define legroom. 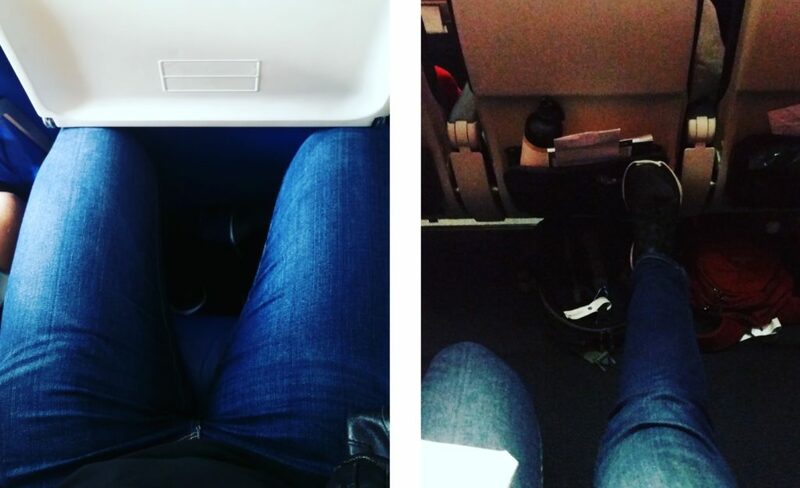 The technical term for legroom between airplane seats is “seat pitch“. This is the distance between two rows of seats on the plane. The problem with airlines is that there is no fixed standard for what the minimum seat pitch should be. It depends entirely on the airline and the type of planes they have in their fleet. Seat pitch can vary anywhere from 28″ (small planes, budget airlines) to 39″ (larger planes, non-budget airline). As a rule of thumb, budget airlines will have the worst seat pitch; there’s no such thing as a free lunch, right? 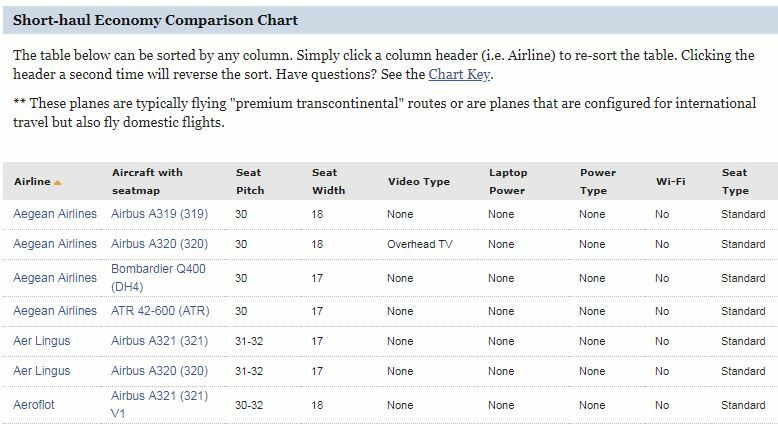 One of the best ways to compare seat pitch for most airlines is at the website: Seatguru. 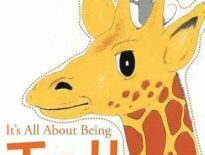 At that site, simply navigate to the Comparison Charts Section. There you will find a wealth of seat data for each airline broken down into short and long haul flights as well as seating class. Here is a snippet of how the comparison chart section looks. Choosing an airline with a good seat pitch is half the battle. The next thing you must do is choose a specific seat for your flight. Just because an airline has good seat pitch doesn’t mean all the seats will fit you comfortably. Remember: not all seats are created equal. The best recommendation for a tall person is to choose an emergency exit seat. These seats however are high in demand (no surprises there) and sometimes you have to pay extra. If you miss out on this seat there is another thing you can do. You can look at a detailed seat map of the plane you will be flying. 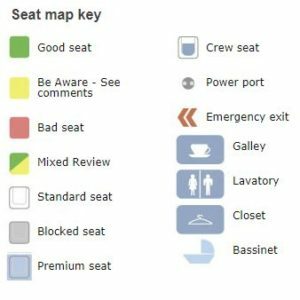 This detailed seat map shows you every seat on your plane and shows you were the best and worst seats are located. The best place to do this is to again visit the website: Seatguru. 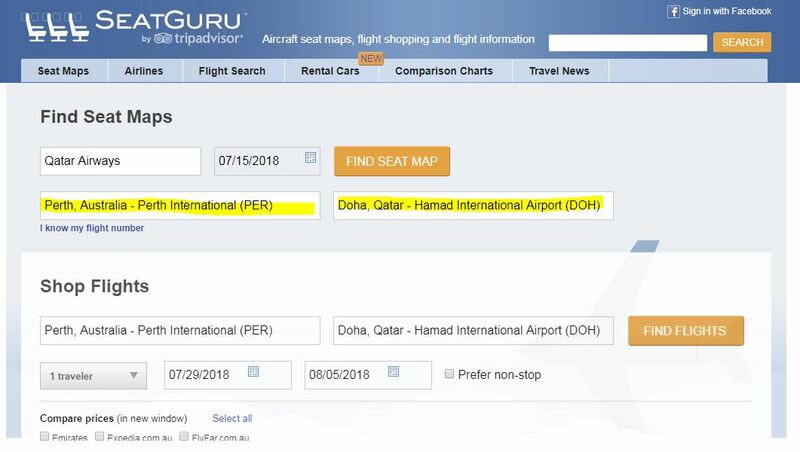 Once at that site, simply navigate to the Seat Maps Section, type in your flight destination and select your aircraft. Step 1: Go to the website: Seatguru. 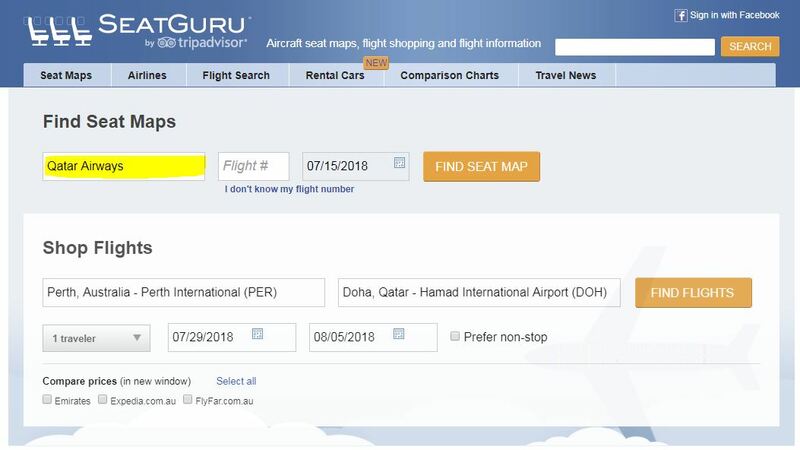 Step 2: At the top of the page, under the heading “Find Seat Maps”, type in your airline in the first field (highlighted in yellow below). Step 3: Type in your flight number (if you know it) and click the orange button: Find Seat Map. If you don’t know your flight number then click the text “I don’t know my flight number“. Step 4: Specify your starting and final destination (highlighted in yellow below) and click the orange button: Find Seat Map. 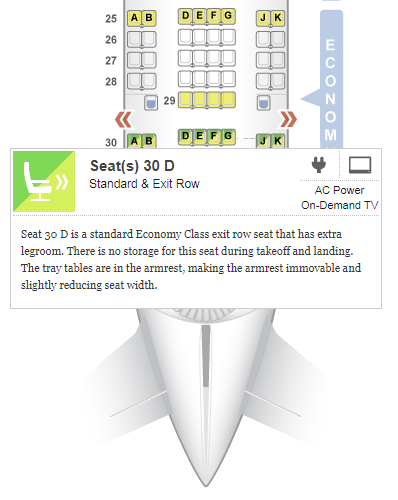 Step 5: Click on the aircraft type to see the seat map (highlighted in yellow below). Step 6: Find the seat best suited to you based on the aircraft seat map. Below is an example how the seat map typically looks. Each seat map contains a key, helping you identify which seats to avoid and which seats you should try to book. That’s it – it’s as simple as that. I wish you all the best with your search for the best seat on your next flight. May this guide come in handy and help you avoid the dreaded crushing legroom seat that I once faced. Share your awesome (or horror) legroom stories below, I’d love to hear from you.